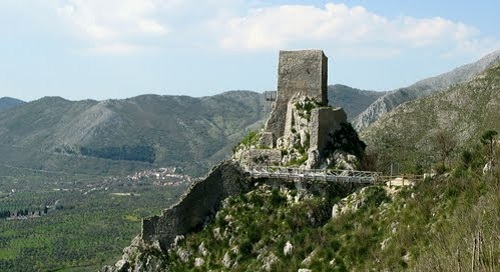 Venafro is situated at the foot of Mount Santa Croce in the territory of Isernia. The municipality stretches along the homonymous plain crossed by the Volturno and San Bartolomeo rivers whose sources are located in the center of the Venafro plain. Other notable mountains are: Monte Sambucaro (1205 m.), Monte Cesima (1180 m.), Monte Corno (1054 m.), Monte Santa Croce or Cerino (1026 mt), Colle San Domenico (921 m). Although its founding is attributed to Diomedes, child of Tydeus and Deipyle, characters in Greek mythology, the ancient name of Venafrum derives from Samnite sources. The only occasion on which Venafrum figures prominently in history is during the Social War, 88 BCE, when it was betrayed into the hands of the Samnite leader Marius Egnatius, Roman philosopher Cicero more than once alludes to the great fertile ground of the territory. Was also mentioned by the roman poet Horace as being a resort renowned for its amenities, and Pliny the Elder, army commander of the early Roman Empire also speaks of the waters located there. On the plain, there have been found numerous findings that suggest the existence of human settlements in prehistoric times. Among the most interesting is a amygdala, an almond-shaped stone, perfectly preserved. Other interesting finds were arrows, knives, awls, and other tools.Most of them certainly belongs to the Paleolithic period (between 650,000 and 10,000 BC), however, not sufficient to provide an accurate picture of the town's origin. Between 774 and 787 the Venafro plain was crossed by the troops of Charlemagne, which clashed with the Lombards of the Principality of Benevento. After the dark period of the Middle Ages, which saw Venafro sinking into poverty and disease in later centuries the city enjoyed an era of expansion and prosperity, with numerous churches and palaces dating from that era that changed the face of the city. Feudal families that reigned over Venafro were the Savelli, Peretti, and the Caracciolo of Miranda. 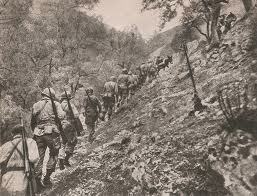 From autumn 1943 to spring of 1944 Venafro was the scene (along with Pozzilli, Filignano, San Pietro Infine) of bitter fighting between the Germans, entrenched in the mountains to the north and the British – French – U.S. along the Gustav Line, during the Battle of Monte Cassino. 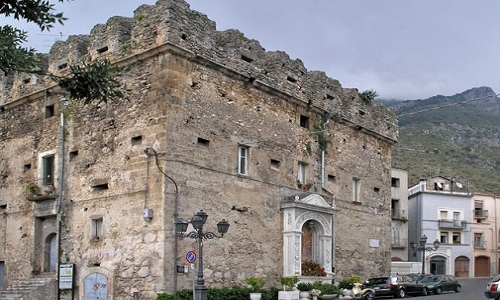 Mistaken for Monte Cassino, Venafro was hit hard by aerial bombing on March 15, 1944. Until 1863 the town was included in the territory of the Terra di Lavoro (currently the province of Caserta), following the establishment of the province of Campobasso was annexed to that territory. It was later incorporated into the Molise region and consequently into the province of Isernia, despite controversy and often violent protests that favored to remain part of the province of Caserta. In the spring of 1984, the city was severely damaged by the earthquake originating in the nearby Valle di Comino, in the province of Frosinone. 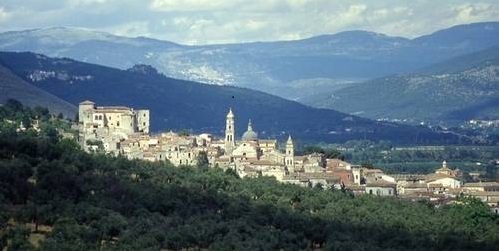 What to see : Venafro can be divided into two distinct areas: the old town, of Roman origin, enclosed by walls and dominated by Castle Pandone, and new town that has several newly developed neighborhoods. The old town was built on the existing Roman urban structure. The upper floors of buildings are residences, while the lower floor of the premises are used as shops. Verlasce Roman Amphitheater: Located in the center of modern Venafro and despite development overlap are the still visible remains of the Roman elliptical amphitheater. It is believed that the stands could hold up to 15,000 spectators. Until some time ago, this structure housed stables and stores of agricultural tools. The Roman Theater: On the Decumanus Maximus, is a theater of considerable size with an auditorium capable of hosting 3,500 spectators. 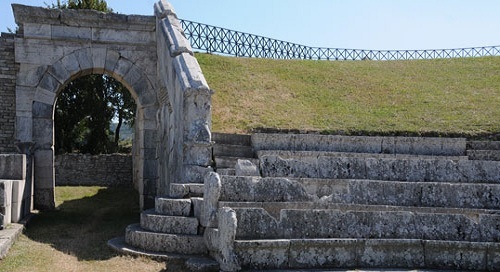 Samnite, Roman and medieval remains: In the town center are visible traces of a Roman aqueduct, the walled city of the Samnites dating from the 4th century BCE and one polygonal Samnite structure of the 1st century BCE. 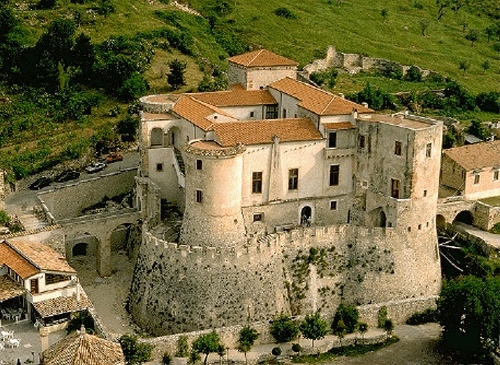 Of Roman origin is the "Torricella", a fortified structure recently restored to its former glory. Other monuments include "Market Tower" (Palazzo Caracciolo), a defensive structure with its massive medieval battlements, in defense of that which once corresponded to the eastern gate of Venafro, and the Palazzo Libertina of the 20th century, which served as a hydroelectric plant to provide power to the town. 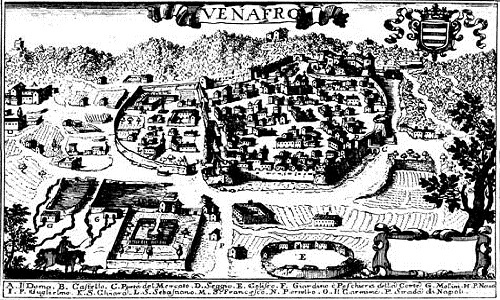 Due to a large number of churches in the area Venafro was given the nickname "The city of 33 churches." These are many churches of various sizes and ages in the historic center and in the foothills area. Unfortunately, many places of worship are now closed and abandoned. 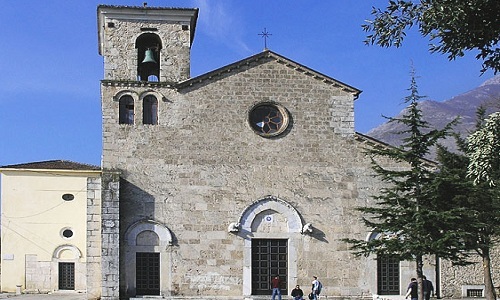 Venafro Cathedral, the largest church of the city, is situated at the foot of Parco Oraziano. Dating from the 5th century, it was built under Bishop Constantine in the place where for centuries there was a pagan temple. The Church of the Annunciation (Chiesa dell"Annunziata): The church is an example of Baroque architecture built in the 14th century, and has been repeatedly amended over time. It was built with material from a nearby Roman theater and had a gabled façade. 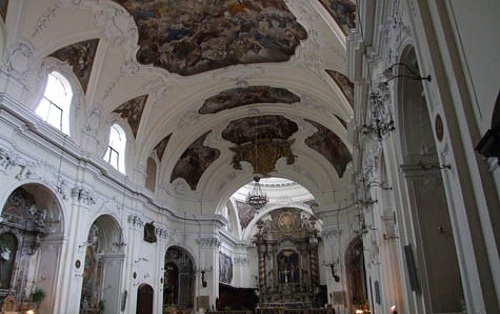 Over the centuries it underwent a major restoration and the church assumed its present Baroque appearance. The single nave interior preserves a crucifix of the 14th century. In a lateral niche is the silver bust of St. Nicandro with a some relics of martyrs. The church also has a large frescoed dome, visible from every point of the city. 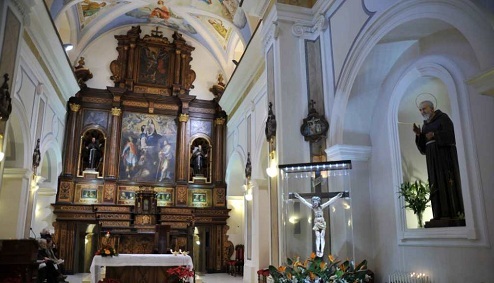 The church and convent of St. Nicandro: On the eastern outskirts of the city on the road to Isernia, the Church was built on Roman ruins, that were partly used in the construction. The church has repeatedly changed and was restored in 2001. It features two naves and retains an altar in wood marquetry and pyrography. Under the altar is the crypt the tomb of St. Nicandro was discovered, a spring called "Manna of St. Nicandro" also appears in the crypt. The church of the Last Sacrament called "Christ": The church has a single aisle and presents stucco cornices and capitals. There are several paintings and at the top of the nave in special niches are the statues of Four Evangelists. The church has two small domes with no windows, and a Baroque bell-tower, looking similar to the Church of the Annunciation. 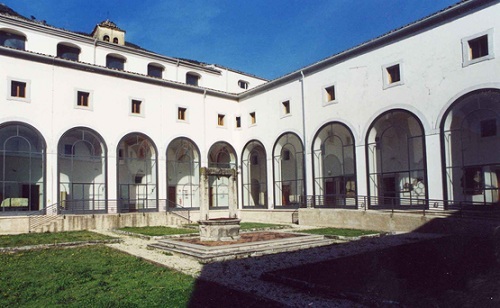 The National Archaeological Museum "Santa Chiara" . 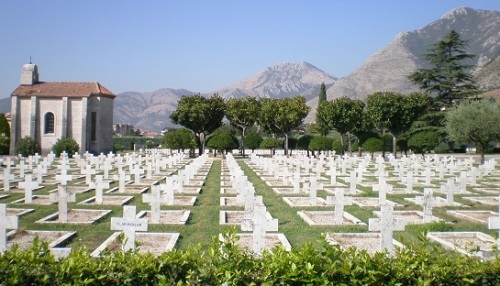 The French Military Cemetery: Along Highway 85 to Isernia, on an extended flat area is the French war cemetery. Notable are the two thirds of African origin, mainly Moroccan, Algerian, Tunisian and Senegalese, who fell in large part during the Battle of Monte Cassino. Inside, there are tombs of the Unknown Soldier dedicated to soldiers: one Tunisian, one Algerian, and one Moroccan. The World Wide Fund For Nature (WWF) Mortine Oasis: The Mortine Oasis occupies an artificial waterway created by the construction of a hydroelectric dam. The set of aquatic habitats are surrounded by a hygrophilous (willows, poplars, alders) forest. Regional Agricultural Historical Olive Park : The Parco Oraziano behind the city's cathedral became the Regional Agricultural Historical Olive Park of Venafro. 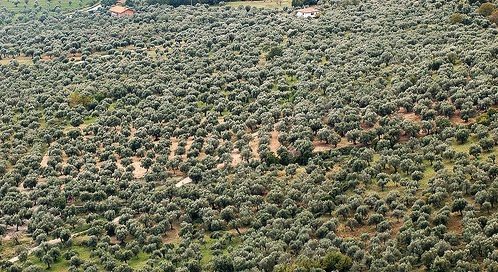 A regional law aimed at establishing a protected area to preserve the heritage of Venafro’s olives and olive trees. The Regional Agricultural Historical Olive Park of Venafro is the first park in the Mediterranean area with an olive theme.